You may have noticed that on every version of interact, when people share their quiz results there is a tryinteract.com grey link at the bottom of the share. Because of recent changes that Facebook made there is no way to not have this and I'll do my best to explain why (we obviously don't want it to be there because we want the quizzes to be fully white labeled). So here's the explanation of why this is happening. Facebook recently changed their method for social sharing. 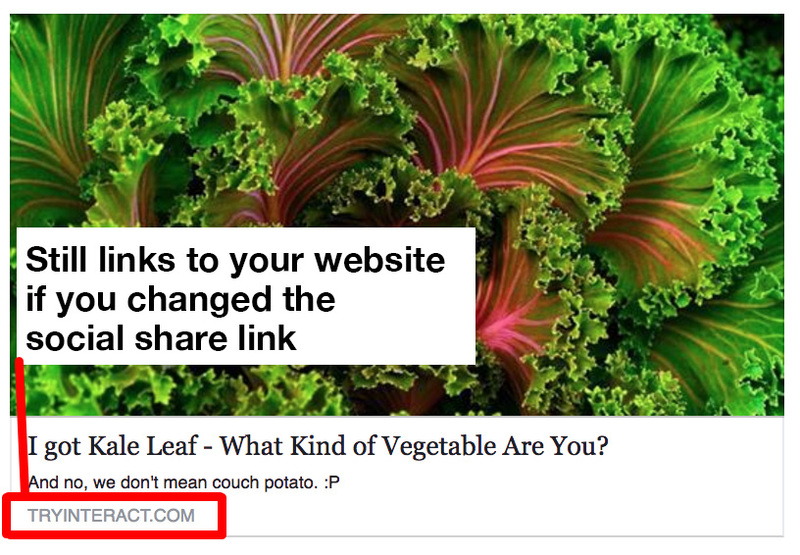 The way it works now is that when you share a URL (for example mysite.com/quiz) Facebook will automatically grab an image and text from that page, and there is absolutely no way to change that. So what we had to do is set up the social share to share the tryinteract.com URL which has the image, text, and title of the person's quiz result. Now, we were able to set it up where when someone shares their result, it does redirect to the social share URL you put into interact, so it still goes back to your website, but there is absolutely no way to make the URL you put in show up when someone share their results. I know this is frustrating and hard to understand, we've explored literally every option, and there is no way around doing things this way, there is no quiz builder that exists that doesn't have the same issue. We have contacted Facebook about the issue and have not gotten a solve for it, for now they have restricted quizzes to work this way, it's up to them to change it in the future.